Do not be fooled. The castle of Taulignan, which had its hour of glory between 1992 and 2000, is now abandoned, the manager fugitive in Qatar. The building is very far from the photos that present it, in an advanced state of decrepitude. Moreover, it would be illegal to buy it from the alleged seller (s). Many attempts have been made in recent years to sell this house to you by one of the family members. This castle is in family ownership, no one can decide to dispose of it without breaking the law. Even visits are illegal. The former SCI in charge of the property is without any more existence because of the cessation of all its legal activities since 2004: absence of assemblies, signatures, declarations … All necessary lawsuits shall be brought against any person who undertakes acts of sale, publicity or advertisement without the formal agreement of the whole of the owners, as well as in the event of an intrusion, assimilated to violation of domicile. The castle of Taulignan is a private property that has been dedicated to guest rooms, beautiful period when it was in perfect condition. It has since been abandoned. Nevertheless, he is not without owner. His destiny does not end there. His story will soon be published here. Many photos will also be presented (rights reserved). Ne vous faites pas abuser. Le château de Taulignan, qui a connu son heure de gloire entre 1992 et 2000, est désormais à l’abandon, les anciens gérants chassés, le nouveau en fuite. Le bâti est très loin des photos qui le présentent, dans un état avancé de décrépitude. De plus, il serait illégal de l’acheter au(x) prétendu(s) vendeur(s). De nombreuses tentatives ont eu lieu ces dernières années de vous vendre cette demeure par l’un des membres de la famille. Ce château est en indivision familiale, nul ne peut décider d’en disposer sans contrevenir à la loi. Les visites même sont illégales. Toutes poursuites nécessaires seront engagées contre quiconque entamerait des actes de vente, publicité ou annonce sans l’accord formel de l’intégralité des propriétaires, de même en cas d’intrusion, assimilée à violation de domicile. Le château de Taulignan est une propriété privée qui a été consacrée aux chambres d’hôtes, période magnifique où il était en parfait état. Il a depuis été laissé à l’abandon. Néanmoins, il n’est pas sans propriétaire. Son destin ne s’achève pas là. Son histoire sera bientôt ici publiée. De nombreuses photos seront également présentées (droits réservés). PDT PROVENCE — Do you ever wake with a start when traveling, having forgotten where you are? No worries: unless you’re olfactorily challenged or catatonic it’s physically impossible to do so at the Chateau de Taulignan. 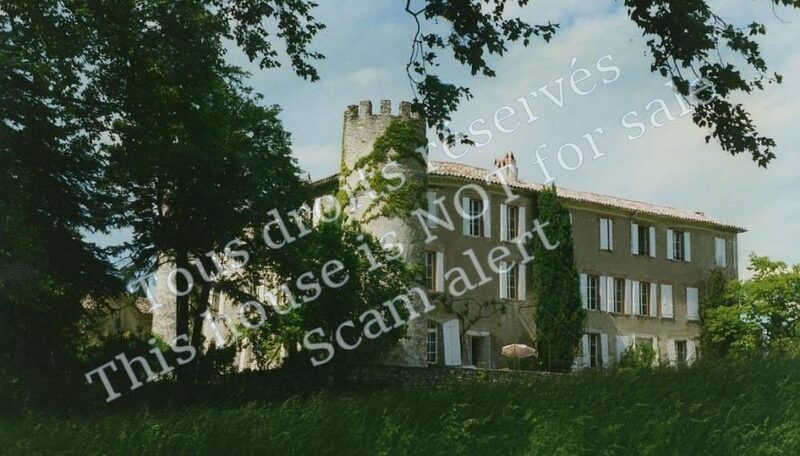 This owner-occupied B&B (called a chambre d’htes in French) hides its towers among swaying sycamores in a verdant vale about two miles east of Vaison-la-Romaine. That’s on Provence’s northern edge in the Vaucluse, the region that Petrarch (not Peter Mayle) wrote about in all those romantic poems 600 years ago. Having arrived at this homey castle in the dark the night before, I woke up feeling like I’d been sewn into a potpourri bag. If a smell can have a color, this one’s was purple. The scent of lavender, thyme, rosemary, violets and pine permeated my room. That was no easy task, given the room’s regal square-footage and satellite ceiling. I rolled out of my antique, emperor-sized bed, clattered over the worn terra cotta floor and threw open two sets of windows that were about 10-feet tall. On the gentle breeze from the garden, where moss-hung fountains splashed, more scents blew in: mimosa, jasmine, mint, laurel, camomile, broom, rock rose – a panoply of luscious allergens. Everyone knows Provence is the land of milk and honey, I said to myself, but who has ever heard of lavender and mimosa blooming at the same time? Little did I know that the chateau’s young but industrious owners, Cecile and Remy Daillet, use Provencal essences to make the soaps, shampoos, creams, lotions and, of course, potpourris strewn about the place. Luckily it was too early in the year for hay fever and I was so delighted to be there that I didn’t even sneeze. The Chateau de Taulignan was not only a pleasant discovery, it turned out to be perfectly placed as a base for exploring the nearby Dentelles de Montmirail wine country and the hulking Mont Ventoux to the east. These parts of Provence are still full of surprises, even for those who’ve read all the books and visited the region’s must-see sites. To say the area is undiscovered, though, would be silly: the Romans took it over from the Celts, and Petrarch’s Provence became a lavender-scented tourist attraction centuries ago. Nowadays, July and August see the ritual invasion by vacationing Parisians and Lyonnais. Still, out of season you feel like you have Vaison-la-Romaine and its environs all to yourself. Early on my first morning, I strolled around the lower, more ancient part of town where the Romans built their villas and monuments starting in the 2nd century bc. Beyond the archeological excavations (houses, a portico and amphitheater) stretched the 2,000-year-old bridge that survived the killer flood of 1992. I wandered across it and down to the banks of the quicksilver Ouvze River. A local was wetting a line and pulling out wild trout like magic. « It’s clean enough to drink, » he boasted in a chummy way. I allowed that he might be right but said I’d rather let the trout do that. He rose to my bait: soon he was sipping a glass of wine at a nearby cafe and I was on my second coffee-and-croissant. There’s no better way to learn about a place than to ask an angler what’s what. Up in the crow’s nest medieval part of town south of the river, the cobbled roads coil among the requisite old stone houses, most of them restored to a startling degree of perfection. The fisherman was right: the view from the still-ruined castle up top was worth the ankle-twisting climb, especially if you enjoy having a foretaste of what the area offers. Ctes-du-Rhne and Ctes-du-Ventoux vineyards, olive groves, orchards awash with wild flowers, scrubby pine forests, mauve-tinted rock outcroppings and brooding mountains encircle you. What most maps don’t show (but locals like my fisherman know) is that five miles south of Vaison a fingerling of an unpaved one-laner squiggles from behind the medieval hill village of Le Crestet into the sawtooth mountain range behind. These pine-shagged pinnacles of Jurassic limestone looked to me like Jurassic tyrannosaur teeth. The French insist on calling them dentelles – lacework. To each his own poetry. The gravel road to the Dentelles zigs and zags among vineyards stitched around the lacework. A more vigorous trekker would have walked up from the valley. But I parked at the pass (called the Crte de Saint-Amand) and picked up a hiking trail there that leads down and then up again to the mountains’ most spectacular portion. It’s called the Col du Cayron. As I huffed and puffed amid bone-dry vines and fragrant broom, then crossed a babbling brook, I spotted a clutch of eccentric dentists cleaning the tyrannosaur’s teeth with giant lengths of dental floss. Upon closer inspection they turned out to be rock climbers scooting up and down the Dentelle’s 300-foot incisor cliffs. The view from on high – at 2,300 feet or so – was already better than that from Vaison’s chateau. There spread the Rhne Valley’s vinous contours, watered by one of the world’s great rivers. Vast flocks of sheep scampered in the grass between rows of poplar trees – windbreaks against the Mistral. Looking east, though, the 6,000-foot peak of the Mont Ventoux seemed even more appealing. That’s where I’d head tomorrow. By the time I’d hiked back to the car and nosed it onto an asphalt two-laner to the nearby crow’s nest village of Suzette, I was hungry enough to eat anything, even crepes. Luckily they were unavailable so I settled for a rosy duck breast and garlicky potatoes, washed down with the local red. The local reds just happen to be among the Rhne Valley’s finest – Gigondas and Beaumes-de-Venise. Their primary composition is Grenache, Syrah, Mourvdre and Carignan, but the Rhne area’area’s general rule book allows for blending of up to 23 different grape varietals. These wines boggle the mind and palate, especially when tasted in such a spectacular setting. Few parts of France, in fact, pack so much roughshod natural beauty and great wine into so small an area. Bring a designated driver and a car with a big trunk. After slaloming down to the village of Beaumes-de-Venise the main road loops north past the Romanesque chapel of Notre-Dame d’Aubune. Its venerable campanile rises like a finger, pointing at the Dentelles behind. Judging from the grape bunches sculpted on the campanile’s pilasters and columns, winemaking has been going on here for a long, long time. Most visitors bypass the village of Vacqueyras, possibly because the name is unpronounceable. Don’t: it doesn’t take long to walk around the circular, sycamore-lined drive at the foot of the medieval citadel. A handful of wineries based here make some of the area’s biggest underrated wines. On the way back to the Chateau de Taulignan I tooled into and strolled around a handful of other winemaking villages stacked at the base of the Dentelles. Gigondas, the biggest of the bunch, has cluttered its otherwise atmospheric alleys and squares with pieces of contemporary installation art. Happily, Sablet and Sguret have resisted the temptation, guessing that their best draw will always be their medieval gateways, Romanesque churches, fountains, castles and serpentine footpaths. You can easily spend a week exploring the Dentelles de Montmirail and the tiny road and hiking trails linking them. But I couldn’t resist spending my second day driving up to the top of Mont Ventoux. The two-lane road corkscrews through vineyards, then tilts up into a windy wilderness. The mountain’s name – Ventoux – means just that: windy. Too late for my own good, I realized that here the knife-like Mistral wind seems to blow unabated year long. The Ventoux’s peak and flanks are snow-covered for about five months of the year. Apparently the temperature is often about 50 degrees lower up top than down in the valley. I hiked around on an empty trail, my teeth chattering and arms covered with gooseflesh – from the cold and the gorgeous views. You can see the entire Vaucluse departement and part of the neighboring Luberon from here, the Alps, the Alpilles and a hundred toy villages. No wonder there is little vegetation other than contorted pines: incessant wind, snow and rain (twice the average of nearby Vaison-la-Romaine) have turned the mountain into a limestone wasteland of austere beauty. Sault, east of the Ventoux, is a curious mountain settlement built in a semi-circle. I wandered into an old shop run by an old lady selling old bric-a-brac to the rare visitor. The whole town was redolent of sweet fragrances, like my B&B. I discovered why: honey-lovers make a beeline here for the celebrated lavender honey. It was too early in the year to see Sault’s fields of purple majesty (lavender blooms in full summer), so I followed signs west to the Gorges de la Nesque and spent the next two hours oohing-and-aahing. After the medieval tower and ramparts of Monieux, the road started to look like the cardiogram of a heart-attack victim. I almost had a pump problem myself, peering down the cliffs into the churning Nesque River for 25 miles of sheer geologic wonder and impressive civil engineering. After a series of tunnels intercut with neck-twistingly spectacular views, I coasted into a farm town called Villes-sur-Auzon and was delighted to find another medieval citadel ringed by a sycamore-lined avenue equipped with cafes and restaurants. As I luxuriated on a leafy cafe terrace I braced myself for more travails. What I had to do to get back safely to my B&B before sunset, I figured, was survive another dozen perched villages, chateaux and Romanesque churches, plus those endless, see-forever views of the land of wine and honey. Vaison-la-Romaine and the Dentelles/Ventoux area is about 20 miles due east of Orange, 35 miles northeast of Avignon. TGV high-speed trains from Paris, Lyon or Marseille stop in Orange and Avignon. By car, take the A7 autoroute and exit at Orange, then follow the D975 to Vaison.